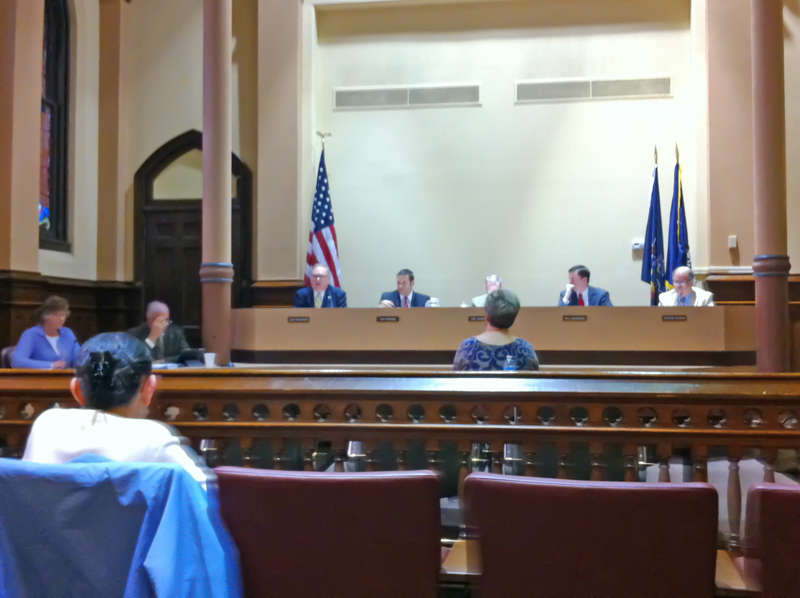 Scranton City heard from residents Marie Schumacher and David Dobson, among a few others, but there was no specific topic of discussion. Familiar issues were raised, such as concerns with consultant Henry Amoroso, infrastructure issues, and tax-exempt businesses not contributing. Dobson cited an issue he saw with recycling, stating that after he spoke with DPW (Scranton Department of Public Works) he found out that only half the city’s recycling actually goes into recycling. Dobson also expressed concerns with trucks utilizing the old Salvation Army lots, despite gates and the building being closed at the end of the day. None of the citizens grievances or concerns were directly responded to by the conclusion of the meeting. Council members Wechsler, Rogan, Evans, and Gaughan offered comments prior to the time for the evening’s motions to be voted upon. Councilman Wechsler mentioned a concerned citizen who brought to him an issue of water runoff into their yard, and he stated that the issue would be looked into. He also announced that East Mountain Fire Station has reopened, but repair work is needed on the building’s roof. Councilman Rogan thanked DPW for work they did to correct complaints by Green Ridge residents. He stated he was exploring options with Mayor Courtright to deal with sidewalks between West Side and South Side. Rogan announced that the city was finally coordinated a new street light provider. Rogan also regaled how the history of contract work with street lighting always starts off well, but ends poorly. The previous contractor was warned that if its performance did not shape up, their contract would be terminated. Council is looking to expedite the new contract. Rogan claimed it should only take two weeks, instead of three. Rogan hopes the mayor approves the arrangement next week. Councilman Gaughan mentioned that residents from the 500 and 600 blocks of O’Hara Street wish to be included in the 2015 street cleaning calendar for the city. He also thanked those who organized the marathon last Sunday. Councilman Evans announced that the city will be getting a running total of “Quality of Life” tickets soon, and they are getting the collection rate ironed out. Evans expressed concern about the demolition of historic buildings in Scranton. There was a motion to enter into three contracts, one for a finance audit for the fiscal years ending December 31, 2014; December 31, 2015; December 31, 2016; and December 31, 2017. Another motion pertained to electrical contract work for the new street lighting contractor for one year, extending from April 9, 2015, to April 9, 2016. A motion for a contract with Joseph M. Alu and Associates to perform the Scranton Single Tax Office audit for years ending December 31, 2013, and December 31, 2014, was also made. There was a motion to accept grant funds in the amount of $2,200 for the fire department to purchase two cameras for the fire inspector’s office. There was one motion to further civilian parking enforcement tickets, and another motion to further continue exploration of concessions or lease agreements for parking in the city. The meeting agenda my be found here.